Despite a few niggles here and there, Xenoblade Chronicles X is an excellent game that will easily claim many hours of your life. Not only is it odds-on favourite for the title of best RPG of 2015, but it sets a high standard which future games in the genre should definitely aim for. hen Earth is destroyed by aliens, the last survivors of humanity escape aboard the White Whale, a colony ship bound for a new planet. Now, the human race must establish themselves on planet Mira, but carving out a niche for themselves in the local ecosystem won’t be easy. Explore new territory, fight indigenous hostiles and gather the resources needed to make Mira your new home. 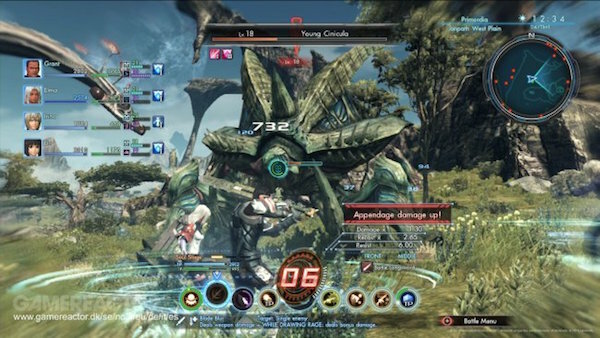 A spiritual successor to the original Xenoblade Chronicles, Xenoblade Chronicles X takes inspiration from the original and turns it into the closest you can get to an MMO in a single-player experience. Gone are Shulk and the Monado; instead, you customise the name and look of your main character. After a tantalising hint of gameplay and a lengthy introduction to your new world, you get to join BLADE – a unit dedicated to exploring the vast open world that is your new planet. The core of the game is the single-player experience, in which you and your BLADE unit pick and choose from a vast selection of missions. Story and character missions unlock as you progress, whilst other quests can be picked up from talking to people or visiting the BLADE bulletin board. As per usual, missions are based around collecting particular items or defeating certain monsters, with money and rare items as a reward. It might sound a bit repetitive, but with such a large world to explore and so many eclectic characters to help out, taking on missions can actually become addictive – for all the times when you find yourself frustrated because a monster refuses to drop a rare item, there will be many more times when you’ll want to complete just one more task. 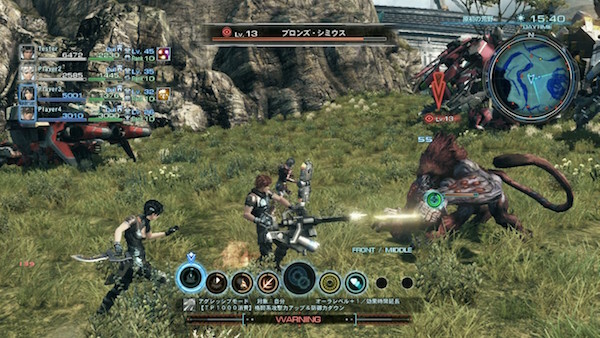 The battle system of Xenoblade Chronicles X will be recognisable to players of the original game, but there are some key differences. Battles are real-time, with players controlling the lead character whilst the AI takes care of up to three allies. Each character is equipped with a ranged and a melee weapon, and it’s up to you to balance safely keeping your distance or risking yourself to go in and do more damage. Later in the game, you’ll have the chance to fight from skells – giant, overpowered robots that can cut a swathe of destruction through the enemy. Skell combat is slightly less interesting than fighting on foot, but it does speed up what would otherwise be long and protracted battles against tougher enemies. On the whole, the open world of Mira is a joy to explore – with five different continents to examine, you’ll easily find yourself thirty to fifty hours in without having seen nearly all of it. Unfortunately, there are times when being in such an open world can be frustrating – even the ability to teleport to numerous points across each continent can’t help when your destination is the other side of a deep ravine or unscaleable cliff! There are also a couple of other inconveniences which can make having such a large world a disadvantage. 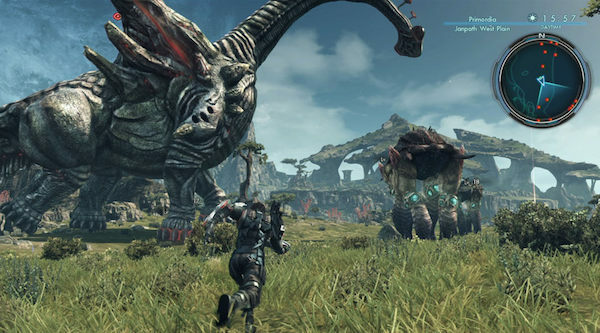 Unlike the original Xenoblade, you can’t change the time of day from the normal menu; instead you have to go to a specific place to do it – particularly annoying when you need to keep changing the time to get a particular monster to show up in a particular place. Similarly, you can’t switch party members from anywhere – instead, you have to check the city map to see where they usually hang out, and then go and talk to them to get them to come with you. Since you can recruit a fair number of playable characters, it’s actually quite easy to forget some of them even exist. 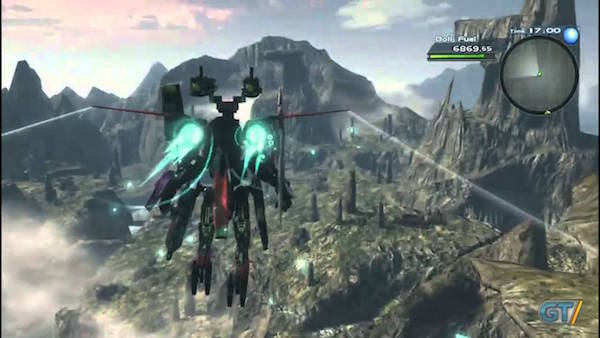 In addition to all the single-player missions, Xenoblade Chronicles X also boasts a fair amount of online content. Even if you’re not interested in taking on any of the online missions, whenever you’re connected to the server, avatars from other players will appear in your world and can be recruited into your party for 30 minutes at a time. You’ll also see short messages from other players from time-to-time – they aren’t especially useful, but it all gives you the feeling of being connected to a wider world of BLADE operatives. The one area where Xenoblade Chronicles X doesn’t manage to improve on the original is in the story; compared to the struggles of Shulk and his friends, this tale feels quite generic and impersonal. It also boasts the obligatory irritating mascot character in the form of chubby alien Tatsu – when the other characters start threatening to cook and eat him, you’ll be cheering them on. With the move to HD, the world of Mira is gorgeous to look at, with detailing that easily puts the original game to shame. Character models are a bit simpler than their environments, but come with many armour customisations – everything from revealing swimsuits to combat armour that complete obscures the entire body. Overall, the music is good, with sweeping grandiose music for world exploration, and faster paced pieces for battles, but unfortunately even the better tracks can devolve into random rap sequences, which are never particularly welcome. If you want to sink your teeth into something meaty and substantial, then this should be top of your purchase list.